Passes valid for children 10 years old and younger. Skate Rentals are $4.00 Extra Child must be accompanied by parent for the pass to be valid. Cannot be combined with any other offer. Pass may not be used with groups or birthday parties. Not valid for private parties or special events. Not valid for play zone. Listed below are all the hours that the Kids Skate Free passes are accepted at Firehouse Skate 'N Play! Better than our Kids Skate Free Program. 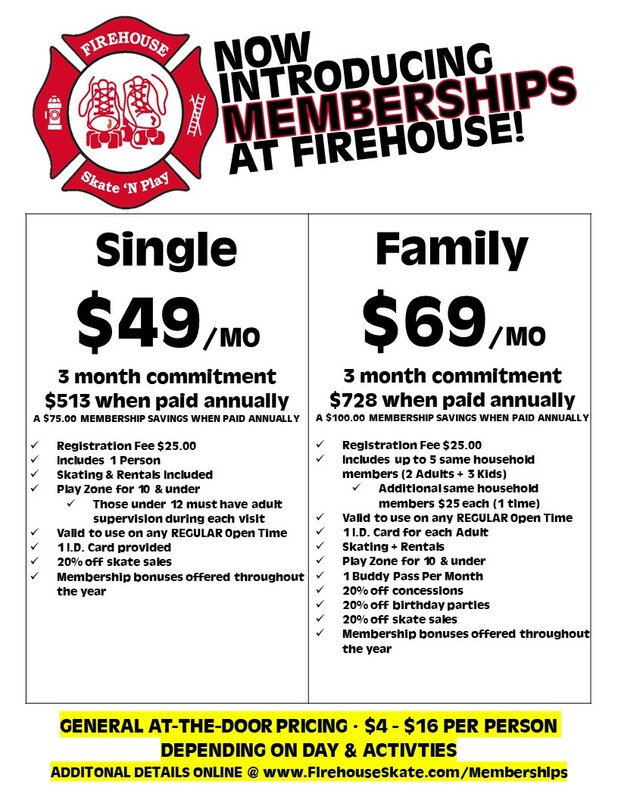 Check out our Family Memberships now offered at Firehouse Skate N Play. Kids Skate Free Passes ONLY include skating admission for kids 10 and younger. Skate Rental and Play Zone are not included. Family Memberships include EVERYTHING for ALL members in the family. *PLUS* savings in the snack bar, birthday parties, and new skate sales.